Do you know how good something has to be to rack up more than 21,500 5-star reviews on Amazon? Really, really, really good. The OontZ Angle 3 Enhanced Stereo Edition IPX5 Splashproof Portable Bluetooth Speaker fits the bill for sure. 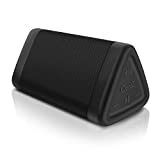 It’s been the best-selling portable speaker on the Amazon site for more than a year now, offering great sound and 12 hours of playback per charge. At a discounted price of $22 and change, you really can’t go wrong.